On the occasion of the release of the brand new Nintendo Switch game TIED TOGETHER, we at UVASONAR Media Pool are pleased and proud to announce a continuing formal cooperation with the Dutch music production team of MODULARMOOD. After a joint pitch for the Netflix series DOGS OF BERLIN in spring of 2018, Roman Beilharz has now mixed and mastered the highly charged and catchy soundtrack of the Nintendo game Tied Together by Jurre Werner and Lars Burgwal. It is now available on all relevant online music platforms. Other common exploits in the field of film and games music are hard to avoid after having spent together a hot day on the beach of Scheveningen, Netherlands chasing seagulls this summer. 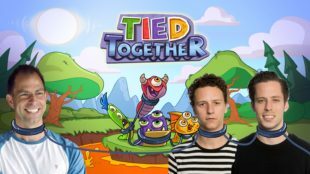 What the two multi-instrumentalists have cooked up musically for the unusual multiplayer adventure based on 4 escaped, tied together monsters is an insane stew that cleverly combines retro elements with modern sounds and crazy Frank Zappa melody runs. You should definitely check out their work!